Partly-printed vellum DS as president, one page, 16 x 10, January 10, 1820. 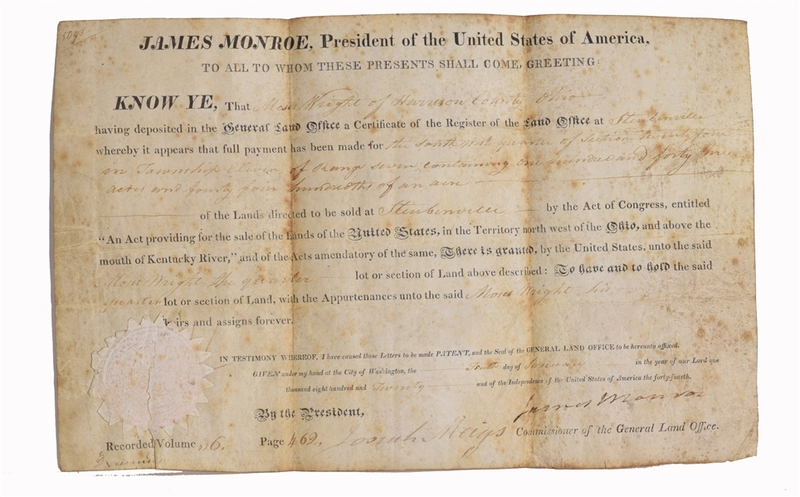 President Monroe grants a "certain Tract of Land, containing One Hundred and Forty Four Acres." Signed at the conclusion by Monroe, and countersigned by Commissioner of the General Land Office Josiah Meigs. White paper seal remains affixed to the lower left. In fair condition, with soiling, staining and some handwriting faded but mostly legible, John Monroe's signature is quite dark.